There are some days that I just stare at the klozet fighting with own thoughts debating if I should wear what I really want to wear or if I should try something different to give variety to the blog....Friday was one of those days. So this is me...wearing a skirt that I wore last week, and a top that has been featured three times in the past two weeks (yes...three times already). At the same time my boyfriend was telling me "but that's you, that's what Nany's Klozet is all about...remixing" and I was like "I know but I need to space them out a little haha". So this time I wore this asymmetrical red skirt with a denim top and brown accessories. The sunglasses were a gift from a close friend from college that just opened her online store called Vanity Gal, check her out..I'm very proud of her! I wore this outfit to the Jennifer Lopez and Enrique Iglesias concert, I had so much fun. I especially liked Enrique's performance, his interaction with the audience was incredible ...he was truly amazing! On the other hand, JLo disappointed me a little....she looked amazing on the concert screens but it was all about HER. I'm gonna add some pictures of the concert below and a picture with Gabo- you have to check out his outfit, I got him the super cool pants! Ok...that's it! Hope you had an amazing weekend! XOXO! Creo que ya les he mencionado, hay días que me da una confusión mirando al klozet debatiendo si debería usar lo que realmente quiero usar o usar cosas diferentes para no aburrirlas y darle variedad al blog... el viernes fue un día de esos. Así que aquí estoy yo...usando la misma falda que usé la semana pasada y un top que ha salido tres veces en menos de dos semanas (sii!! tres veces). Al mismo tiempo mi novio me decía "pero de eso es lo que se trata Nany's Klozet de re-usar" y yo le decía "siii pero no tan seguido!!!" jajaja. Esta vez utilicé la falda roja oscura asimétrica con un top de denim, accesorios café, y dorados. Los lentes de sol fueron un regalo de una amiga a quien quiero muchísimo, estudiamos juntas en la universidad y acaba de abrir su propia tienda online: Vanity Gal (pasen por ahí, estoy super orgullosa de ella). Esto fue lo que utilicé para ir al concierto de Jennifer Lopez y Enrique Iglesias, la pasé genial. Especialmente me gustó todo el segmento de Enrique, me sorprendió su interacción con el público (hay una foto que puse en Intagram que parece que me esta señalando y todo <3 <3 ). Lo que me decepcionó de JLo es que era un show para las cámaras, se veía WOW en las pantallas del concierto pero al verla desde la silla... no se ... faltaba algo! Ok ya escribí mucho, espero que hayan tenido un fin de semana espectacular! Abrazos inmensos a tod@s! 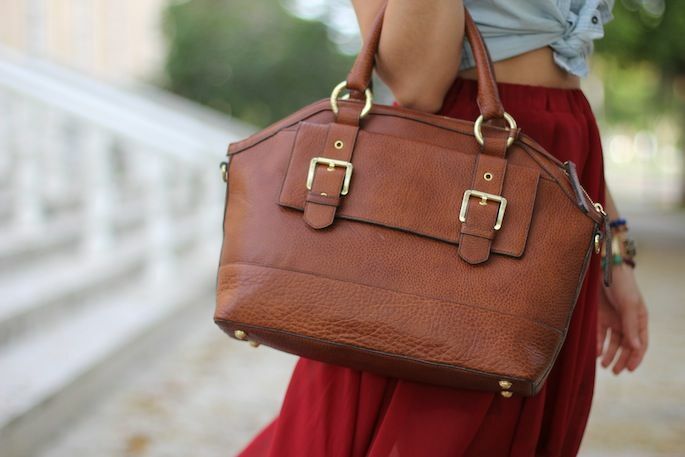 Bag: c/o Brahmin "Dakota Satchel"
i have a similar skirt :)so pretty! your boyfriend is right...one of the reasons I was drawn to your blog in the first place is because you wear affordable pieces and teach me new ways to mix and match my wardrobe. i used to go shopping all the time but somehow NEVER had anything to wear. that was because i lacked basic wardrobe pieces and constantly bought expensive trendy items that weren't versatile and went out of style quickly. over the past yr you have taught me how to make the most out of my closet by purchasing only things i can wear 3 different ways (or more!) and by showing me how to wear them multiple ways. you guys look great! love how you styled the high low skirt. very nice look for a concert! me encanta el outfit!!! y tu novio tiene razón, la esencia de tu blog es aprender a reusar la ropa!!! todo un acierto!!! que pedazo de cocierto!!! lo que hubiera dado por estar ahi!!! que suerte!!! besitos y me alegro que lo disfrutaras!!! Nany, no te preocupes por lo de repetir la ropa... al fin y al cabo, de eso se trata la moda, no? de jugar con una misma prenda combinándola con prendas y accesorios diferentes! Una pregunta, el de la última foto, es tu chico? Gabo's pants are rad and I wanted to go to this concert but I spaced out and totally forgot. I love your outfit, and that top is really cute. The other day I heard one of Enrique's songs and remembered my big love to him when I was 13 years old. Lovely look! Love your skirt and your boyfirend’s t-shirt is sooo awesome! Cute chambray top, love the tie-up! The skirt and bag are so lovely! WOW, I adore the burgundy color of the skirt! 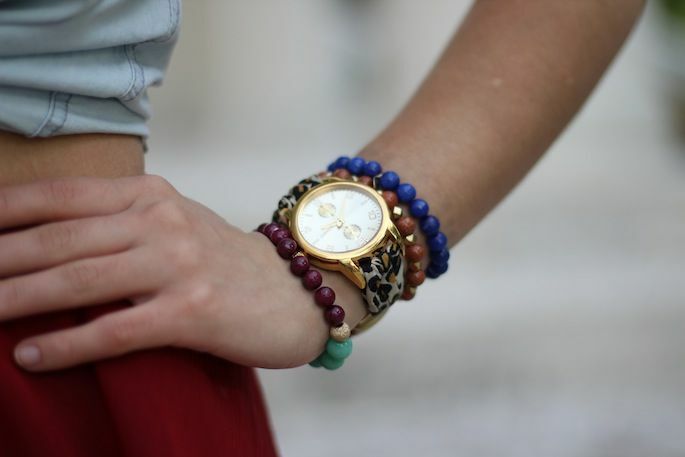 Looks amazing in combo with denim. Great look! I so love this combination! Bellisima pero SUSTITUYE YAAAA ESOS ZAPATOS!!!! you look beautiful! I loive the color combo and the bag is just right.